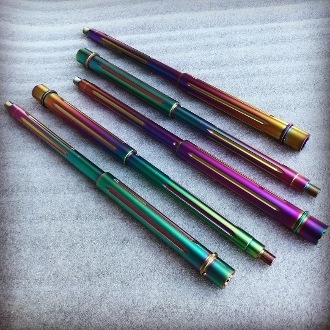 This mind-blowingly amazing oilslick rainbow tactical unicorn chameleon snowflake neochrome coating is now available on super awesome barrels to match the already super awesome bolt carrier groups. 16" length, Carbine gas unless otherwise noted. Select the add on option to add to your custom designed upper, select the PVD barrel of your choice, then add the 16" barreld upper of your choice to your cart. The 16" PVD barrel you select will be installed to replace the barrel on the upper of your choice! Call for any questions!